240 VAC 50-Amp Switch, AC Connectors: Screw-type wiring Terminals. 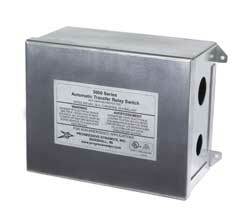 Heavy duty contactors prevent contact damage during high current transfer operation. Rugged, heavy-duty, screw-type wiring terminals ready to wire to contactor base. Ensure ease of wiring and prevents wiring errors. Screw-type wiring terminals ensure ease of wiring and prevent wiring errors. Easy to remove protective cover with wiring schematic mounted inside.